1. Hedge against inflation – In turbulent economic times when all other means of investment fail including the stock market, gold bullion coins are your hedging investment mechanism to preserve your savings or at least a portion of your portfolio. 2. Solid investment assets tested for centuries – There’s just no denying it that gold coins have always been the timeless assets of the rich and famous no matter what historical time frame you look at, whether it’s Maya’s civilization, era of famous Kings, Emperors or many other historical figures. Purchasing gold bullion coins is simply a smart choice for any savvy investor. 3. Value based on the spot price of metal – Bullion coins draw their value exclusively from the price of precious metal, so they go up in price when the gold does. Additionally, purchasing gold bullion coins is a great cost savvy way of purchasing the metal as commodity opposed to over-priced jewelry and volatile rare historical coins. 4. High liquidity – It’s not a surprise that bullion coins are easy to buy and sell, so you can rest assured that if you need money you can always sell your coins for highly needed cash. Some gold bullion sellers will even buy your coins back from you, just ask. 5. Well diversified portfolio – Keeping gold coins as part of your investment portfolio helps you balance out investment risks and create a solid financial future. Just remember to keep gold assets in the range from 5-10%. 6. Easy to store and carry – The ideal way to store your gold coins is in a bank’s safe deposit box, but should the tough times come, you can easily carry your gold possessions in a small bag or briefcase. You gold coins will always be there for you when you need them! 7. Survival benefits – Some individuals focus on purchasing gold bullion coins of smaller sizes ranging from 1/10 to ½ of an ounce of gold in preparation for potential economy default when major banks could go bankrupt and paper money gets completely devalued. At times like that, gold coins become incredible bartering means for trading basic supplies and food. 8. Savings Incentive – Purchasing gold bullion coins sets an incredible investment goal that is easy to stick to. Would you save up to buy stocks? Probably not. 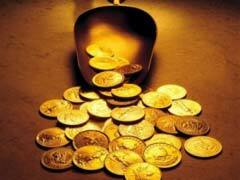 However, you are more likely to set money aside to buy gold coins. 9. Excellent value to cost ratio – If you compare bullion coins to any other purchases like jewelry or rare coins, it’s quite clear that by purchasing gold bullion coins you are avoiding all the “extra” costs like jewelry design and manufacturing cost or special mark ups. With bullion choices, you are paying a little bit over the spot price of gold in dealer premiums and insignificant manufacturing costs. 10. Purchasing gold bullion coins is both beneficial for your portfolio and a fun activity with so many different origins and designs to consider. When you are having fun, you are more likely to stick to your resolutions and meet your goals. For your investment needs consider Gold Eagle coins mintage, one of the most popular types of bullion coins available at the market. If you are a collector, there are American Eagle gold proof coins that are highly coveted in the numismatic society.